Travertine is an attractive variety of limestone known for its distinctive swirling and texture and it’s a popular choice for kitchens and bathrooms. 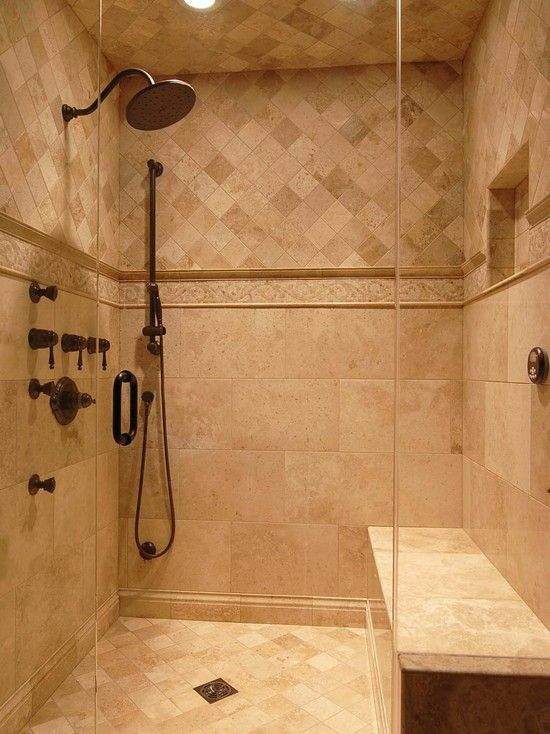 If you have a travertine shower then you know the surface can be riddled with small, naturally-formed pores, which are prone to collecting soap scum. However, by keeping up with routine cleaning and maintenance, you should have no trouble keeping your travertine shower looking great…and if you are tired of these little holes you might be interested in one of MARBLELIFE’s lesser known services where they can fill these in to make a more uniform easier to maintain surface while maintaining the natural look of this beautify stone. 1. Clean your shower after you use it. Sounds simple enough, but there’s a practical reason too. The running water of your shower helps to loosen and soften surface dirt on your tiles. Making cleaning much easier than if you were to go in dry. Using a squeegee to squeegee done the area you know can get bad is a quick way to keep on top of things between cleanings, and to extend time between cleanings. The soap generally is deposited as the soapy water evaporates so by removing most of the standing water from your glass and walls this mechanism is halted, or reduced depending on how much water has been removed. This works for the wall portion, but can be an issue if there are holes common with travertine, as this process pushes soapy water into these natural holes. As such, a better strategy with open-travertine is to rinse these areas thouroughly to dilute and wash away excess soap while it still in solution. This makes the moveable hand shower head preferred in these showers. 2. Use non-acidic soap scum remover. Just like all limestones, travertine sensitive to acids. So it’s important to remember to use a non-acidic stone cleaner like MARBLELIFE® Soap Scum Removeror MARBLELIFE® Marble & Travertine InterCare Cleaner. MARBLELIFE Marble & Travertine Cleaner is an excellent choice for day to day cleaning able to remove oils and other deposits without introducing waxes or acids that can trap dirt or etch your stone. However, once soap begins to build up we are no longer cleaning stone but a soap surface. These films can sneak up on you, almost seeming to appear overnight. Once present they can require a lot of elbow grease to remove OR we can work smart. MARBLELIFE Soap Scum Remover incorporates some clever thinking developed in the field to enable MARBLELIFE service providers to quickly clear away the soap so they could repolish or restore the surface below. MARBLELIFE Soap Scum Remover is formulated with an abrasive engineered to be harder than soap but much softer that stone, so that when the abrasice touches the stone it little crumbles away. You can literally feel it working, and more importantly feel when it is done, as the sound changes, and you can feel noticeably less drag. You get a sense of accomplishment because it is done, and pride that you have found a quick way of addressing this nuisance condition. This product works similarly around the oven and microwave where it powers through backed on food without damaging glass, metal or plastic. Once free of Soap all you need is your daily MARBLELIFE Marble & Travertine Cleaner. 3. Scrub tiles with warm water. Using a bucket filled with warm water, begin scrubbing the tiles starting from the top. Scrubbing is such a hard word implying back breaking work, but do not fear. This product works easily with minimal pressure needed and powers through the soap with ease. You will be done before you know it and will see immediate shocking results as the area you are working will be entirely soap free in seconds leaving you amazed as you compare with the stone right next too it. The entire shower can be done in very little time. 4. Use a soft toothbrush to clean grout. This is where most damage is self-inflicted, and we are not referring to careless use of a razor blade. The common myths on how to remove hard water stains from an acid sensitive stone life travertine can result in thousands of dollars of damage in minutes. Tile cleaners (specifically formulated for use on ceramic and porcelain surfaces) often include acids which do not hard ceramic or porcelain but will eat travertine so fast you can watch it bubbling. Common popular hard water cleaners sold on TV will literally dissolve your travertine. Our calls for restoration service jump soon after these spots run. Use of steel wool can scrape it away but do so while also abrading and dulling your soft stone surface. The razor blade allows one to smoothly run between the calcium deposited by your hard water and the stone without scratching, but be careful it is still a razor blade. Once free-and-clear call your local water service company to discuss installing a water softener or filter to remove your rust and calcium impurities else this situation will need to be addressed routinely. After you’ve finished cleaning your tiles, turn on the shower and rinse thoroughly. This is a simple but important step. The first defense against mold and mildew is sufficient airflow to allow your shower to dry. This may mean installing an exhaust fan or increasing its airflow, or open doors, or adding additional fans, but unless the shower can dry out between uses mold will find a happy home. While we can deal with this with MARBLELIFE Mold & Mildew cleaning, no one wants to clean any more than they have to. A few basic adjustments can reduce or even eliminate the conditions that lead to such issues. For any other questions regarding travertine shower cleaning and care be sure to contact your local MARBLELIFE office and knowledgeable stone craftsmen will be happy to assist you. They offer a free estimates and assessment. This can allow you to quickly assess your particular situation and what can be done both preventatively as well as reactively to get things under control. We have a beautiful shower we want to enjoy without having to baby it. Once cleaned, we can assist you with recommendations that can help keep it clean. 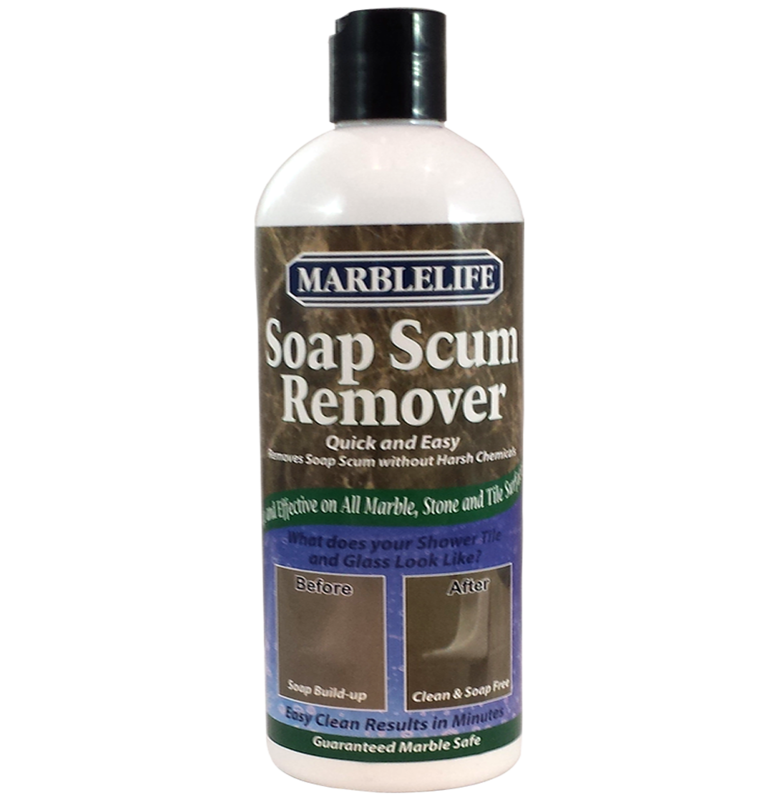 Marblelife Soap Scum Remover is a truly unique product, in that it is an abrasive that will absolutely not scratch sensitive marble, travertine, slate or natural stone showers, including glass, metal and plastic enclosures and fixtures.